Agropolis International is the operator of the Hérault Departmental Council for the research component of the interactions with Chile as part of its policy of decentralised cooperation. The aim is to promote and facilitate scientific exchanges between Chilean and French teams on subjects of common interest. Water quantity and water quality are current subjects in these collaborative research projects, illustrated by models of integrated water management at the scale of river basins. Some examples: diagnostics of the levels of contamination of surface waters by herbicides (INRA/Montpellier SupAgro); coupled (surface water/underground water) characterisation and modelling of hydrous transfers vs. climatic variability/oscillation (Niño, Niña) (University of Montpellier); biodiversity of macro-invertebrates as indicator of water quality and health status of ecosystems. Examples of other collaborative topics: Reconstruction of paleoclimates (isotope analysis and identification of fossil molluscs in Paleoclimatology (University Montpellier 2); Management and conservation of genetic material of plants and seeds (quinoa) (CIRAD); Biotechnology and food traceability (CIRAD); Molecular biology, training workshop (IRD); Bioremediation of sites contaminated by heavy metals (IRD). 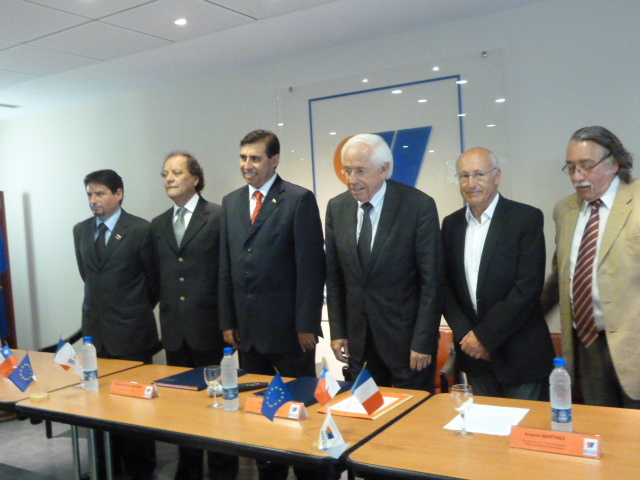 At the occasion of the visit of a delegation of 13 people from Coquimbo on June 2011, the cooperation agreement between the Coquimbo region and the Hérault Departmental Council has been renewed and signed by André Vézinhet, President of the Hérault Departmental Council, and Sergio Gahona Salazar, Intendant of the Coquimbo region. Agropolis International acts as operator for the Hérault Departmental Council on the aspects research, innovation and support to the land management, in order to promote and ease the exchanges between the Chilean and French research teams, thus contributing to the scientific influence of both public authorities. Major themes of these exchanges are: viticulture and wine, biotechnology, water resources, aquaculture and environment. In the context of this cooperation, Agropolis has welcomed from June 29 to July 1st, Prof. Mario EDDING, Director of the Department of Marine Biology of the Facultad de Ciências del Mar, Universidad Catolica del Norte (UCN), Coquimbo, Chile. The objective of this visit was to develop relations between the UCN and the Hérault department. Prof Edding met several scientists from Polytech Montpellier, IRD/Ifremer, BioCampus Montpellier, Montpellier Institute of Molecular Genetics (IGMM).